Sports books can complement your training in an ideal way. Books equip with the knowledge needed in order to exercise at home the right way. Be taken into virtual worlds and enjoy the original shoots in Full HD quality. Increase your motivation while exercising with a training software. In combination with a computer and an Internet connection, the appropriate training software offers you access to a unique training experience. Choose your appropriate fitness equipment out of 150 brands. Our qualified staff is available over phone (free call 0800 2020 277) or in the Livesupport Chat should any questions arise regarding sport and fitness. 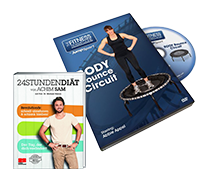 Books, DVDs, and software as well as audio and video devices for more motivation while exercising. You find great training tips or posters, which demonstrate how to do the exercises correctly.